Visit ashleyfurniture.com/jobs, ashleyfurniture/jobs or ashleyfurniture/careers to land on Ashley Furniture careers page on which you can find your ways of applying for a job at Ashley Furniture ranging from selecting career areas, searching jobs by location and participating in job fairs and internships. Here we choose retail as careers area to search available job opportunities. After you select the "Retail" careers area in the last step,you'll be led to the page that shows 8 departments under the retail area and you can pick one that you're fond of and click in. Here we choose "Retail Sales" as an example to continue with the online application. In the last step, we choose retail sales and it turns out many results. 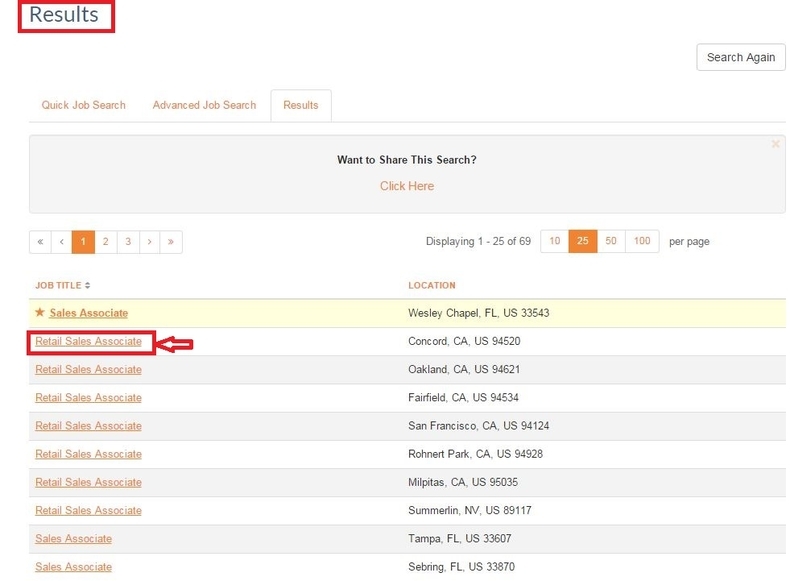 You may click Quick Job Search or Advanced Job Search to help you locate the exact job title or just click the job title in the results if it happens to be the one you want to apply for. 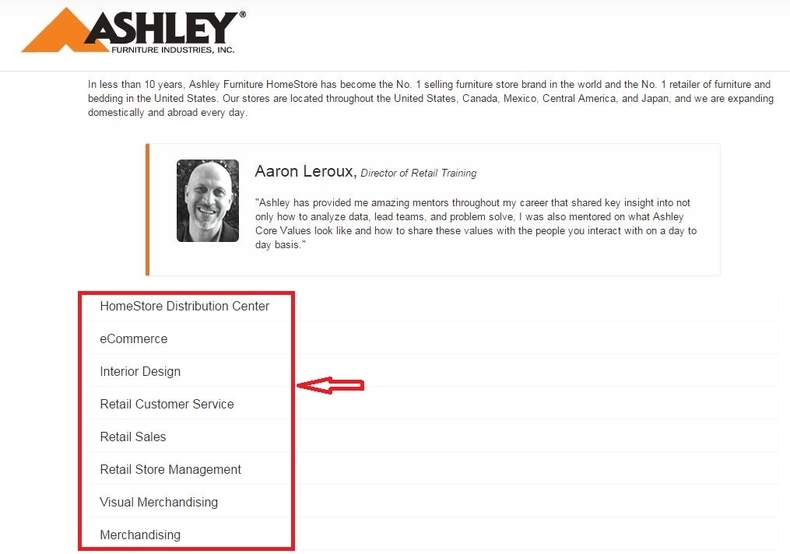 Here we just click the first result to guide you through the whole process of applying for retail sales associate at Ashley Furniture. 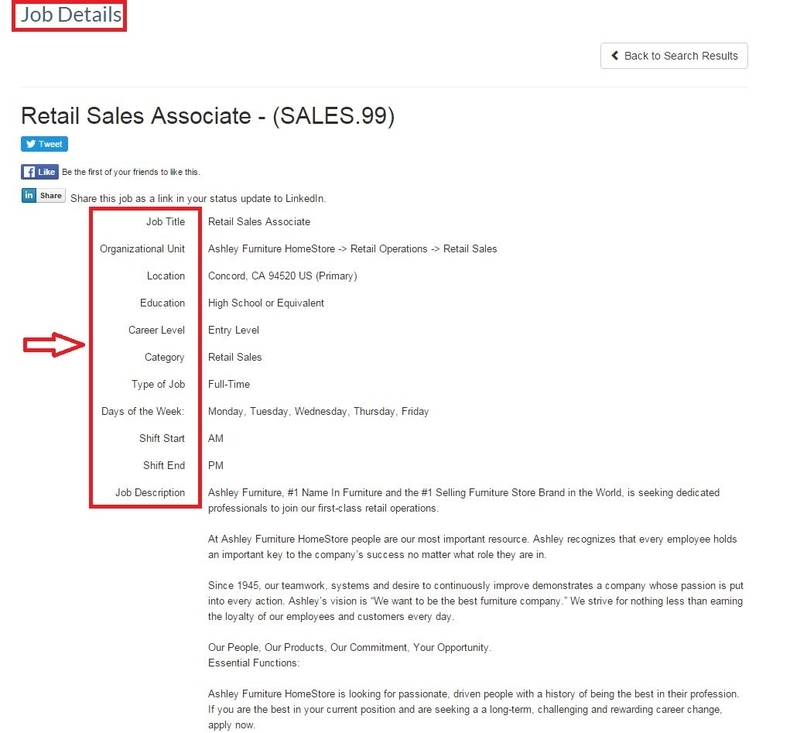 In this section, you're asked to read job details including the job title, organizational unit, location, education requirement, career level, category, job type, job description and requirements, etc.. After you make sure that you are totally qualified for this job, you can click "Apply with Ashley" at the bottom of this page to move on. If you're a returning user, login to access your information or create an account first by filling out the required info if you are a first timer user. 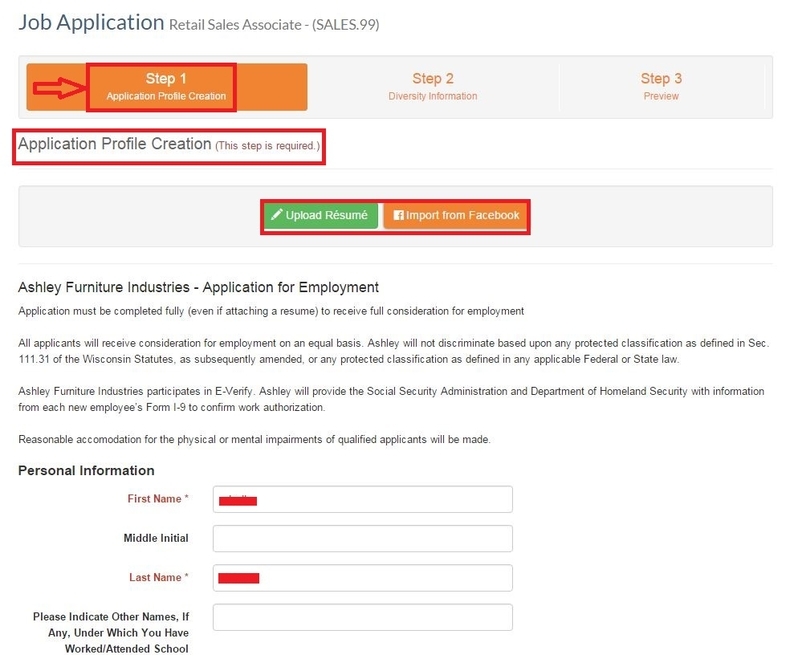 In step 6, you're required to create your Ashley application profile by filling out your personal information, education background info, submitting your resume if you do have, completing your employment history and reading the Authority and Release statements. After finishing all these parts, you need to enter your full name as signature and click "Next" to proceed to the next step. 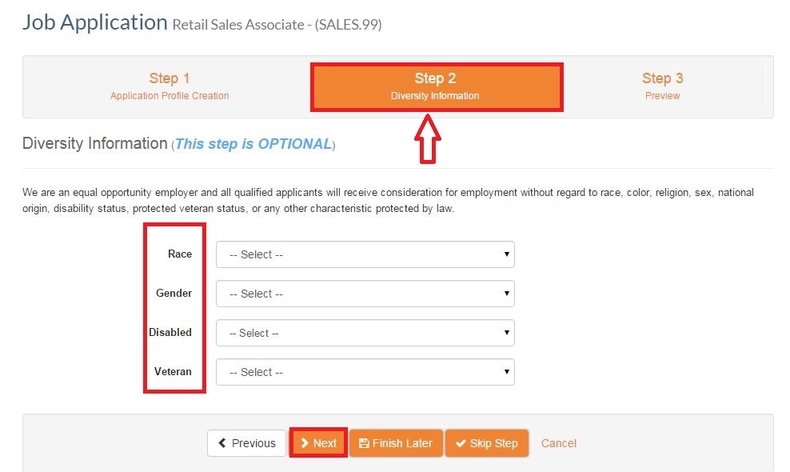 Step 7 is optional which asks you to provide your diversity information by selecting race, color, religion, gender, national origin, disability status, protected veteran status. You can also skip this step by clicking the link below. 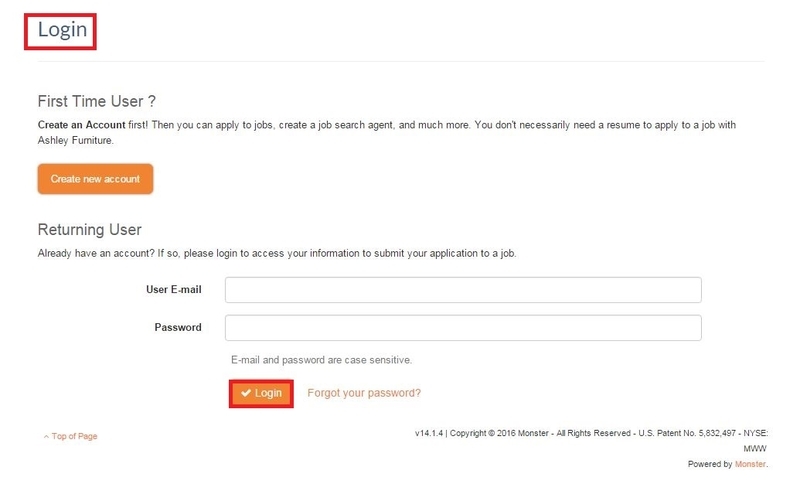 Step 8 is a preview of your application form for application must be completed fully (even if attaching a resume) to receive full consideration for employment. You are suggested to review your application info prudently. If you find something wrong, you may click the Edit button to revise. If everything checked turns to be correctly provided, you can just finish this step by clicking the finish button at the bottom of the page. 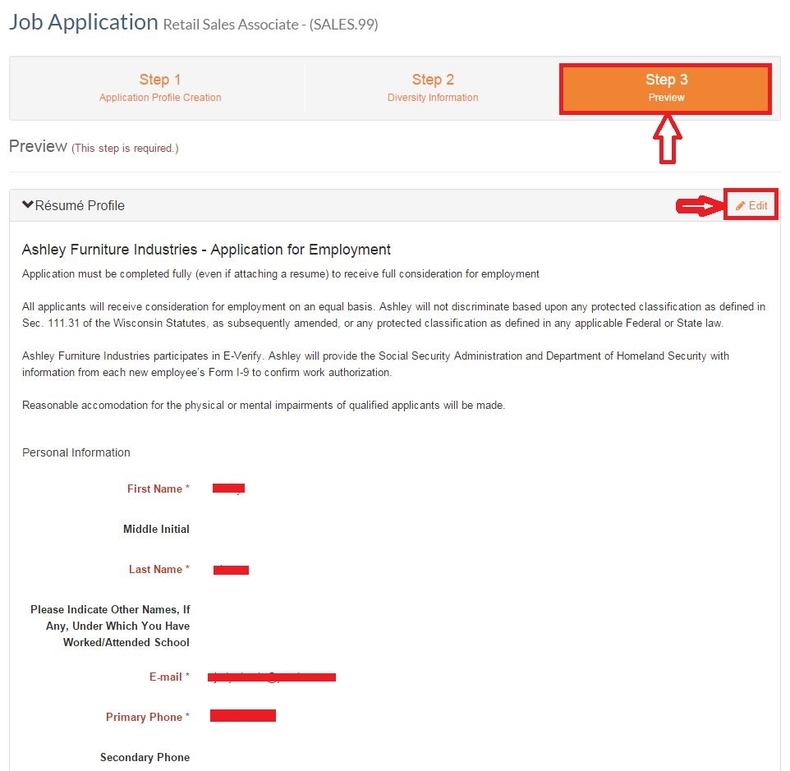 This is the end of the Ashley Furniture online application process, which means your résumé/CV has been forwarded to the recruiting team assigned to your chosen job. If you are among the candidates selected to interview, you will be contacted directly by one of the company's recruiters regarding the process and timing. 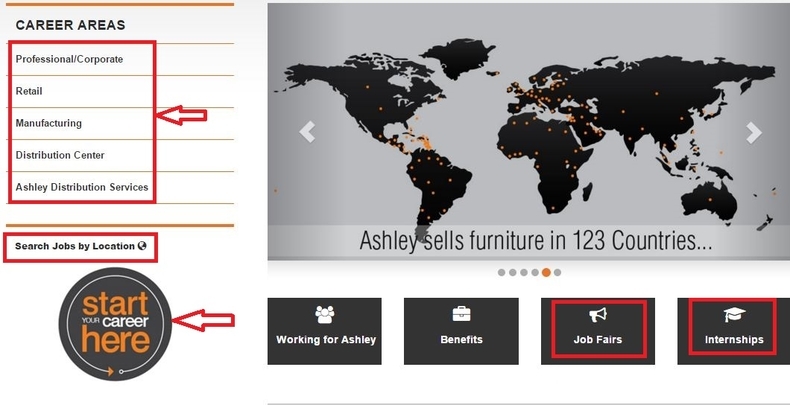 Click ashleyfurniture.com/jobs to apply for Ashley Furniture jobs online.